The Story: On a quiet suburban street, a babysitter must defend a twelve-year-old boy from intruders, only to discover it's far from a normal home invasion. Australian actress Olivia DeJong, who was great in M. Night Shyamalan's The Visit, once again proves to be a very capable hand at navigating the horror genre. Her character gets put through the proverbial meat grinder and she handles every moment with ease and even when her co-stars are less than up to the task. Levi Miller, best known to this point as Peter in the critically panned Pan, is okay for the most part, but ends up being way more annoying than his character needs to be. On the flip side, Ed Oxenbould, also a veteran of The Visit, provides the perfect amount of comic relief just as any good drug consuming sidekick should. 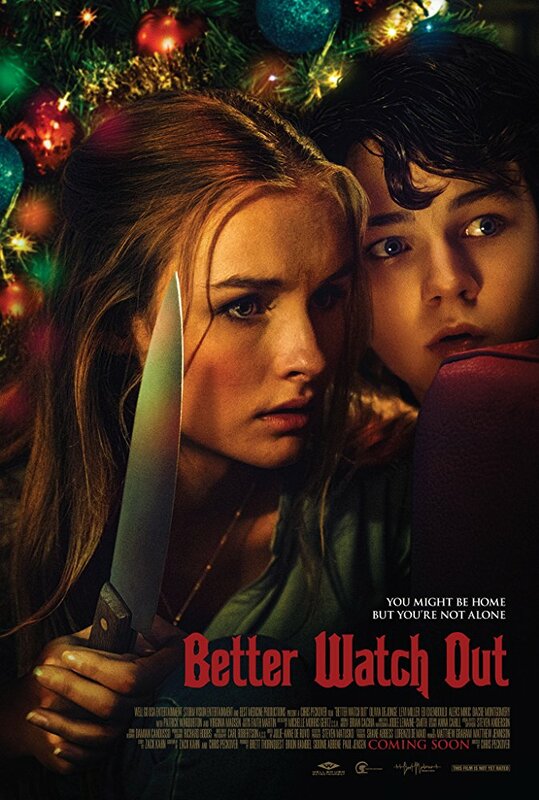 Better Watch Out is a solid entry into the world of holiday horror comedies and is definitely worth a look. If you've ever wanted to see Home Alone turned into a slasher, hostage, home invasion film, then you will definitely want to check this movie out. Better Watch Out is an official selection of the 2017 Seattle International Film Festival.